The result is Revelator, released this week by the newly formed Tedeschi Trucks Band. 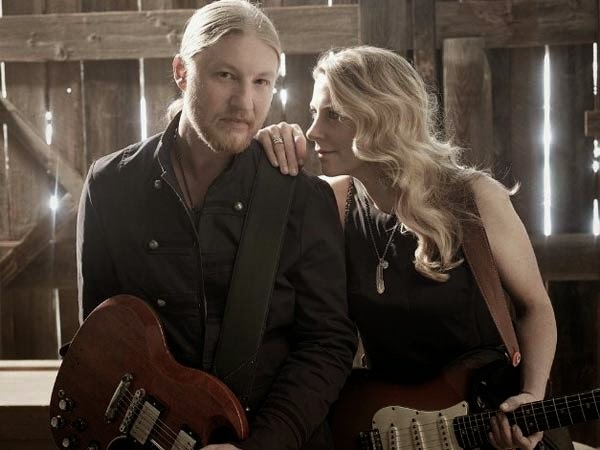 Recorded at the couple’s home studio in Jacksonville, Florida, the album brims with the soulful spirit and grit of classic rhythm and blues, gospel, and rock ‘n’ roll. Trucks : It was just continually writing until we found songs that worked. They were songs that we both felt really great about, and they were really comfortable. Working with the different songwriters was amazing. The whole process was really natural and fun. And I felt like we were always moving forward and working toward something. Probably six months into putting this idea and concept in motion we had fifteen tunes that we felt really good about. Any other time in our careers I think we would’ve just recorded them and that would’ve been the record. With this, we kept pushing until we got to maybe thirty-five, forty tunes and then from that original fifteen — that A list — we probably ended up using two, maybe three songs on the final record. We kept knocking songs that we really liked off the list with songs we liked more, which was for me a unique situation to be in. I’ve always been on the road three-hundred days a year and when you get twelve songs you record them, and there’s your record. This was a totally different thing. Tedeschi: Honestly I don’t think I had to sacrifice anything. We wrote the whole record together and it’s all stuff that I would do on any of my projects. I don’t really feel like I did anything different. It’s interesting a lot of people think that. But at the end of the day, yes, Derek improvises longer solos than I would, but I love to improvise too. And I love all the aspects of all the different styles of music on the record. A lot of the songs on the record are stuff I would’ve naturally done anyway, if the songs were there. So I don’t feel like it was that different. For me it was just more fun because I got to hang out with my husband more. Trucks: We really wanted to spend as much time as it took to naturally get there instead of having ideas and trimming them to fit this mold. We just kept writing. We knew what we wanted to do, but whenever you have a concept [and] putting it into motion it changes a thousand times before you get to where you end up. We wanted to be really open with that and just kind of let it happen. The upside was we had this great studio behind our house, and we know a lot of musicians that are basically family that are world-class musicians that we could keep writing and recording with. We didn’t want to rush it. Trucks: It was a solid year-and-a-half. Knowing what we wanted to do and the level that we wanted it to be [at], at least musically, we went into it just not wanting to rush it. I think we felt like, definitely for the first time, but it might be the only window we have from here on out to actually take our time and really do something. We felt like it’s kind of now or never. Our kids are a little bit older where we can just jump in. We can be home for six months and write and write and record and write. Every step of the process we were recording, and luckily Bobby Tis — him and his father helped me and my brother build the studio — he moved down here and he also engineered the record. So twenty doors down from our house, Bobby was there if there was an idea or anything we wanted to record or tweak. At any hour we could go out into the studio and work. We dove into that and really enjoyed the process and wanted to make sure the band chemistry was right. You can think on paper what’s gonna work and throw it out there. You just don’t know until you gig it. We spent the better part of last year trying different things and seeing what worked, and not really boxing ourselves in until we felt a hundred percent confident with what we were doing. The risk of that is some people see an early incarnation of the band and think that’s what it is. So you’re running against perception. That’s just the nature of the beast. It’s a much longer arc that we’re looking at. Trucks: Yeah. So we went into the recording process feeling really good about the material, knowing that we had a really good list of tunes to choose from. And we had a group of tunes that we knew worked well together, just listening to the demos. Then when you get the band to sink their teeth into it, the layers are there. It’s three-, four-, five-dimensional. There’s a kind of selflessness to the way you play guitar, Derek. It seems more for the greater good of the song or performance than it is to be a superstar soloist — even though you have the chops to do that. Do you have any particular philosophy as far as how you approach playing the guitar? Trucks: I think that’s the overarching view of it for me, especially with a band like this where there’s so much firepower between Susan and Oteil [Burbridge, bassist] and the rhythm section. I just feel like whatever it takes to make that fly, whatever it takes to make that shine… I’m always of the mindset that a guitar solo — whatever solo it is — needs to be in the spirit of the tune or in the music, and it’s not supposed to completely distract from it. I think maybe from growing up in blues bars and seeing a thousand Stevie Ray Vaughan rip-offs and guitar wankery, I’m scared to ever be that. [Laughs] I try to go out of the way to not do that. Any time you’re soloing and improvising, especially on the electric guitar, you run the risk of going down that road. I try to be really conscious of that. Playing with Eric [Clapton], seeing B.B. [King], some of these guys who give you exactly what you need, a lot of times they leave you wanting more. That’s been a big lesson. I haven’t quite gotten there yet, but I love the fact that when B.B. solos — especially in his prime — when he finishes you’re like, “You’re not done. Keep going.” He kind of withholds it from you; he knows it’s there. So that’s always an inspiration. Tedeschi: I enjoy anything that tells a story, anything that has meaning or soul. I think a lot of people are misled that I’m just a blues singer or a blues guitarist. Actually, I grew up singing country and rock and pop and R&B and everything. When I went to college I didn’t even know about blues other than country-blues that my dad had turned me on to. I mean, I’ve been a singer my whole life. And I feel as a singer, other than opera, I don’t have too many styles that I don’t really do. I think they come off maybe a little bit more bluesy, a little bit more gospel, just because that’s my interpretation of the music. At the end of the day, I love singing anything from Hank Williams, Sr. to John Prine and Bob Dylan. Most of those artists you wouldn’t necessarily think of as blues artists. The sky’s the limit when it comes to styles of music with the two of us. I think Derek has a little more of an outreach into world music and Indian, classical, styles like that, but I’ve never been afraid to jump in. I think they’re all amazing. As long as it’s good music I don’t have any problems with it. Definitely he’s a little more exploratory when it comes to jazz and things like that, but I went to a jazz college, so I’m used to being around it. It’s not like it’s so new and out there for me. I definitely enjoy emoting more in blues styles, things like that. You’re used to having versatility. Tedeschi: Yeah, definitely. I think in the last ten years I’ve gone more blues because I found a nook with it. I found a comfort zone there. There was more of a market for it, a more realistic market for me at the time when I was first getting into it. But I love singing everything. If it’s a good song I’ll sing it. Really there’s not any blues on this record, if you think about it. Tedeschi: Right. I just think that’s because I’m more of a fan of people like Ray Charles, people who are also versatile with styles of music but have a more soulful voice. I definitely think that could be why that’s interpreted that way. A lot of my favorite singers are soul singers: Ray Charles and Aretha and Donny Hathaway and Otis Redding. As far has recording in your home studio — obviously it allowed you both to be with your family more — but it seems to have creatively worked to your benefit. There are countless, notorious stories of artists over-laboring in situations like that, though, just obsessing over little things that in the end don't matter. Trucks: I think when you mix unlimited budgets with the wrong drug, you run into that. [Laughs] We don’t have that problem. We’re used to banging it out and hitting the road. Even though me and Susan are home, we realize that if the other band members are down here they have families and they’re not home. So we make sure that when we’re here, we’re working. No, we didn’t run into that. If anything, it allowed us to treat this record like a major record. I don’t think the budgets, [with] the way they are these days, we’d have been able to spend a tenth of the time on the record if we had to go to a major recording studio and knock it out in six or eight days. It let us pretend that we were a major, major act. [Laughs] We got to take our time and do it right. And that was only because we had the studio and, really, the musicians that were a part of it being willing to come down. But, yeah, I always keep that in the back of my mind, those exact stories you’re talking about. Luckily, or maybe by design, everybody in this group — even Jim Scott, who co-produced the record — we’re all from the school of “if it feels good, it’s good.” Most of the time, that’s gonna be first, second, third take. And if you don’t get it in the first, second or third take, you move on to something else and you come back to it. Or maybe that song’s not supposed to be on the record. Susan, can you perceive any arc over the course of your career of how you’ve progressed or improved as a musician? Is that something you take stock of? 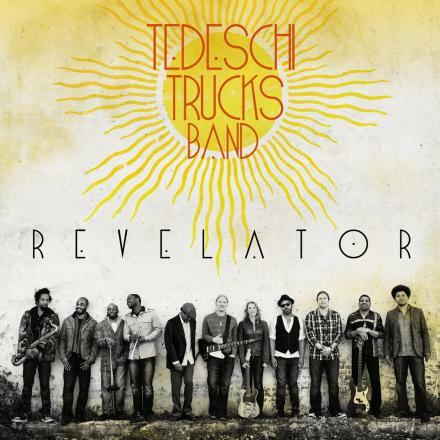 Tedeschi: Yeah, in the last fifteen years I’ve come a long way as a musician just because I’ve been able to play an instrument along with the band. I’ve been singing on stage since I was six, and I didn’t really start playing guitar on stage — especially electric guitar and really learning the guitar — until I was in my twenties. So it was in the last twenty years that I’ve just grown a ton, and I keep growing. Especially playing with Derek and Oteil now, I’m growing more all the time as a musician. I think as a singer I’m always growing too. The one thing about being a musician is that you never know everything. There’s always tons to learn and there’s always so many ways you can improve and things you can do to be a better listener and a better team player, as they say. Tedeschi: I think so too. Every day I keep figuring out new stuff and new ways to be an accompanist and back Derek up while he’s soloing, to make his solos more epic. [Laughs] Because I think he’s so great at what he does that it’s nice to have some people behind him that can support him. He doesn’t always get that. He doesn’t always have a guitar player playing rhythm parts behind him that necessarily help with what he’s doing. I think Oteil is very good at it because he’s been playing with him in the Allman Brothers for a long time. Oteil is also a phenomenal musician, where he has amazing ears; and his brother, Kofi [Burbridge, keyboardist and flautist], as well. And so I feel very blessed that I get to be in a band with the three of them, because now I can learn how to do some of those tricks with them; like how to be more discreet at the beginning of a solo and then build it from behind, things like that. Whereas in the past I’ve only really used it as a tool to back up myself while I’m singing, and then play a solo. And I haven’t always had guitar players there to back up what I do either. I’ve always had to do it on my own. I definitely think I’ll be learning more and I’ll be experimenting more. It’s just going to get to the point, though, where I feel like I’m going to want to be a little bit more included, like when it comes to Derek and improvising and playing solos, because I really love doing that too. I don’t think I really get a chance to do it too much just because there’s so many people in the band and there’s only so much time. And I feel like I’m already occupying a lot of the space, singing. When you have one of the best guitar players in the world in the band it’s hard to… That’s the one thing I think I really give up is playing guitar as much, like soloing and being able to improvise and break out. That comes with confidence, though. You’ll learn to assert yourself more as time goes on. Tedeschi: Honestly I have the confidence. It’s just hard because I’m married to the guy that I have to have the confidence with. It’s different. If it’s anybody other than Derek, I’m fine. I have all the confidence in the world. I mean, I’ve played with B.B. King and George Benson and Buddy Guy. I play with people all the time, but with Derek it’s different because he’s thinking on a different level. He doesn’t think the same as someone like B.B. King or George Benson even. Tedeschi: I don’t know, though. I think he’s in the mindset, like, “Hey, lay out here,” sometimes, which is great for the music, but sometimes I just want to be included more. I think that’s because I had older brothers, growing up. I’m one of those people, I just want to be included. [Laughs] I just want to play.